Asbestos has become something of a bogeyman, but when it’s undisturbed, this mineral is not a huge problem. The problems occur when it’s disturbed, which can happen during DIY or renovations. Asbestos was used in many building materials because it can make structures more rigid and fire resistant. It was used in the UK between the 1950s and 1980s, so many properties, especially post-war council houses, contain asbestos. Almost everyone will breathe in a small amount of asbestos over a lifetime, as it’s naturally-occurring, but when someone lives or works with the mineral and breathes in its fibres daily and over a long period of time, it can cause fatal lung diseases. These diseases can take decades to develop. Where do I look for asbestos in my new home? The most common areas in a home for asbestos to be used include garage and shed roofs, rainwater pipes, ceiling, wall and door linings, central heating flues, older floor tiles and storage heater insulation panels. It may also be found in partition walls. I think I might have asbestos! It’s not easy to identify, but if you suspect you’ve found some asbestos, leave it alone in the first instance. If you think it’s damaged and is shedding fibres, then contact the Health and Safety Executive (HSE) to find your nearest asbestos surveyor. If it seems undamaged, don’t try to remove it yourself and don’t drill, saw, sand or use a wire brush on it. Don’t do anything that will create a dust or powder, as this is dangerous. 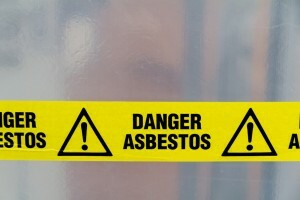 You need a licensed contractor to deal with and remove asbestos. The HSE can recommend a suitable contractor, or you can visit the Asbestos Removal Contractors Association (ARCA) to find one. Can I do any renovation work with the asbestos still in my home? If you have asbestos in your home and want to do some renovations or alterations, you must tell your builders before they start work. They may not have the right certificates and equipment to work with and around asbestos, which means you’ll have to find alternative contractors. Can you cover up asbestos? Yes you can. You can use paint, or even wallpaper with a strong adhesive to cover up asbestos. The aim is to prevent it from releasing dust and fibres into the air. If you choose to paint over the asbestos, you must prime it with alkali-resistant primer and then cover with emulsion or paint. You must NOT “key” the asbestos first.